Hello Hello? Anyone out there? Wow, we've been quiet here lately. I haven't posted for months buts that's because I haven't finished a pair of socks since, well, months ago. 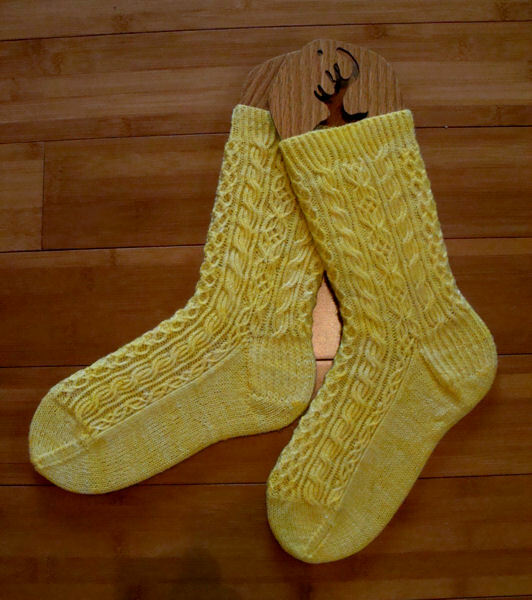 Anyway, I finished a pair today using yarn from my stash that I got about 3 years or so ago. I started the socks a year ago, frogged them, started again, frogged them. It all finally started going right in July when I cast on again. I think the fact my daughter got married in June and I had wedding stuff to work on put a serious cramp in my sock knitting mojo. Anyway, I'm glad they're finally done. I'm gonna have the brightest feet the west side of the Mississippi. LOL! Needles: Addi Turbo Circular size 1.